Port of call … Captains Retreat’s facade. Sue Wallace discovers a retreat close to the sea with rooms to explore. After polishing off fish and chips eyed by seagulls on the Williamstown foreshore, it seems fitting to be staying the night at Captains Retreat, which is steeped in maritime history. The stately two-storey weatherboard was built as a single four-room cottage in 1862, then extended in 1880 for tugboat captain James Dean and his family. The beautifully refurbished Victorian house has had a chequered past; in former lives it was a brothel, a nunnery, flats and offices. Today, it is a 4½-star bed and breakfast, located one door from the water. The exterior of the heritage-listed Captains Retreat belies its size. It’s a huge double-fronted house, with seven bedrooms, eight bathrooms, two kitchens and three living rooms. Hugging a laneway, the house then expands out the back to incorporate six guest rooms with en suites, three with spas and two with private lounges. With many rooms featuring odd angles, nothing is quite square in the entire house, which is part of its charm. Upstairs, our spacious Captain’s Spa suite – predominantly decorated in white, with lots of natural light – has a comfortable lounge area, a small balcony overlooking Ferguson Street and a bay-window reading nook. The room was once home to Australian novelist, playwright, poet and short-story writer Harold (Hal) Porter, whose first stories were published in 1942. In his 1966 memoir, The Paper Chase, he spoke of his rented room, voicing concerns that new owners had offered him tea in a red plastic cup and, to his horror, spoke of modernising the lodgings. Porter left the following week, despite his love of the “brine-saturated wind of the sea”. He also mentioned his favourite painting – a copy of Isle of the Dead by Swiss painter Arnold Bocklin – which he enjoyed looking at before bed and first thing in the morning. In a nod to Porter, the present owner, Melissa Meek-Jacobs, has had the painting copied on the wall so guests can admire it from the comfortable queen-size bed with antique mahogany bedhead. A portrait of one of Williamstown’s founders looks down from the wall in the lounge area, which has an antique leather-top desk, gas fire, comfortable couch and a large mirror. The new bathroom is spacious, with a double shower, deep spa bath and slate tiles. There’s a porthole window, as well as stained-glass cathedral-style windows. From the room’s balcony, you can see the masts of yachts moored at the Royal Yacht Club of Victoria, which was founded in May 1853. In need of a coffee fix, we head to the guest lounge room, which has a unique ceiling – it’s the timber roof from an old Melbourne tram. As a bonus, we enjoy a slice of “Aunty Marie’s banana cake” as we sink into comfortable chairs. The lounge opens to a sunny, flower-filled patio, where breakfast is often served, while the downstairs garden has circular paving, made from recycled clinker bricks, flowering trees and plants as well as cumquat, lemon and orange trees. Their fruit often ends up on the breakfast table. I sink into a steamer chair and enjoy the sea breeze and watch the bird life – doves, blackbirds and finches drop by the bird bath for a quick dip. Next morning, we head out for a brisk walk along the foreshore, watching dinghies, yachts and boats ride the waves while joggers and cyclists pass us by. 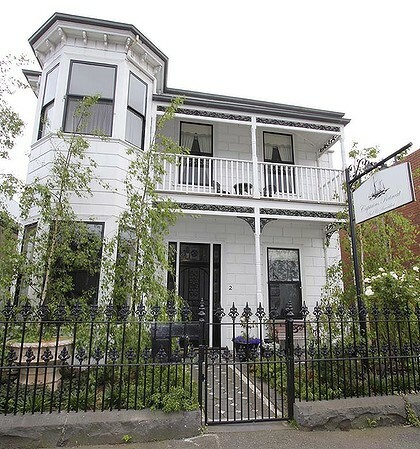 Williamstown has a healthy coffee scene but we return to Captains Retreat for our own hearty breakfast on the sunny patio. It’s impossible to go past the Captain’s special – a cross between scrambled eggs and an omelet, with spring onions, spinach, tomato and bacon served on sour dough. And the finishing touch? Aunty Marie’s homemade relish. I smile when my coffee arrives in a china mug with “First Mate” emblazoned on it. Address 2 Ferguson Street, Williamstown. Phone 9397 0352, see captainsretreat.com.au. Cost From $165 a night, which includes full cooked breakfast and help yourself to coffee, tea and cake. Getting there Williamstown is about 12 kilometres south-west of Melbourne’s CBD and about 20 minutes by train from Flinders Street Station. Summary Nautical themes and sea breezes.